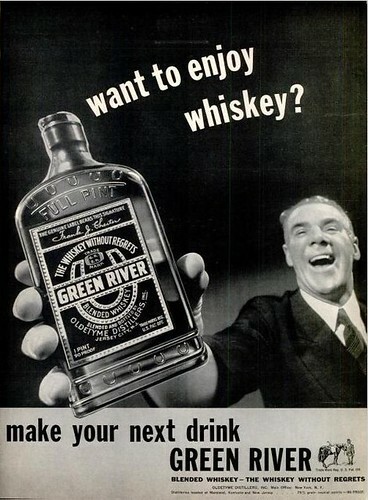 I don’t know much about Green River whiskey. There’s not a lot of information to be had out on the Internet. An odd site, here, is devoted to Green River memorabilia. 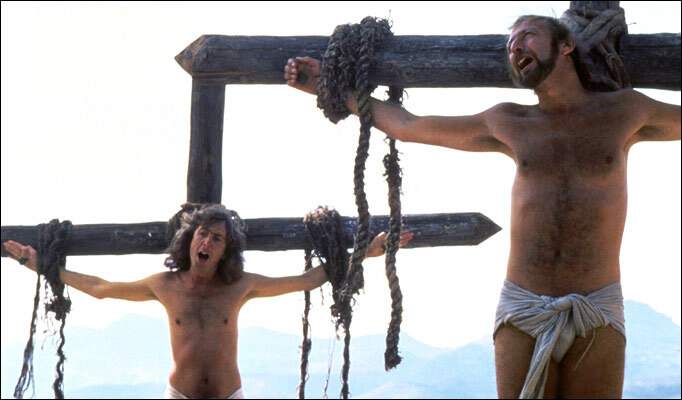 For some inexplicable reason, the site is named Brian. The brand’s defunct, from what I can tell. The wonks at StraightBourbon say that it was once a straight whiskey but became a blended after Prohibition. This wasn’t uncommon, from what I’ve learned. 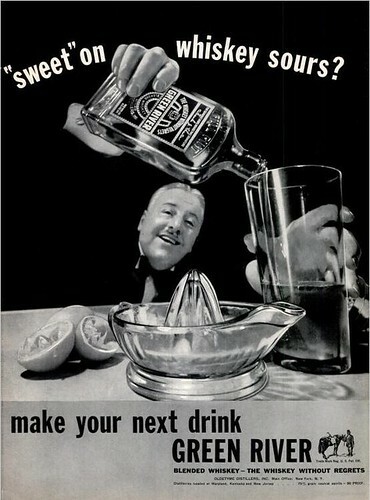 American tastes veered toward the lighter blends post-Repeal, primarily because that’s what was primarily available during the Noble Experiment–blended Canadian whisky. 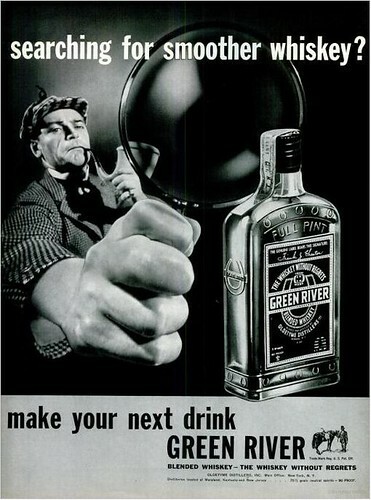 The distillery that made Green River is again operational. Angostura purchased it for bourbon production, but I’m not exactly sure what Angostura’s making there. On a personal note, Green River’s home, Owensboro, Kentucky, is just an hour’s drive from my hometown, Evansville, Indiana. The Green River, in this case, is an Ohio River tributary that arises in central Kentucky, runs through the Mammoth Cave system, and feeds into the Ohio near Owensboro. It’s not actually the river of the CCR song, but what the hell. 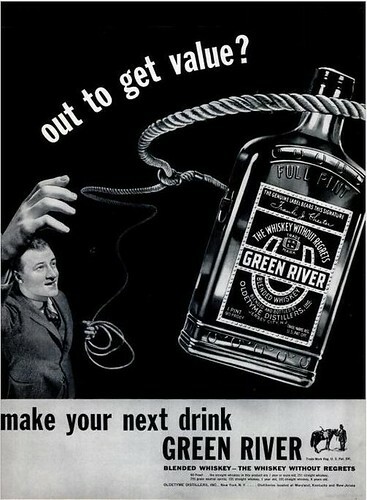 Here are seven Green River ads. I think they’re kinda charming, even if the blend they sold probably wasn’t so much. This post is useless without actual pictures of barefoot girls dancing in the moonlight…. Fun ads I guess, but I was really looking forward to the barefoot girl dancing in the moonlight. 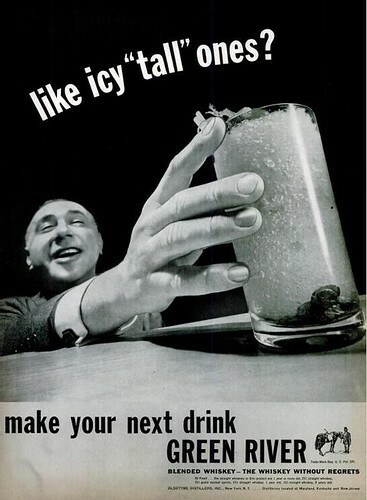 I’d drink to that. Didn’t get the credence ref either. So, I’m not quite sure that I understand. Angostura bought the distillery but they aren’t producing anything out of there? 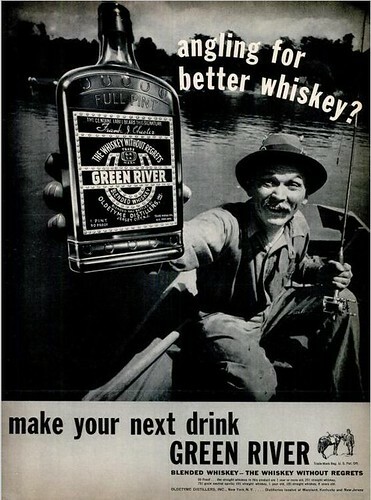 Or are they going to start making Green River Whiskey again? 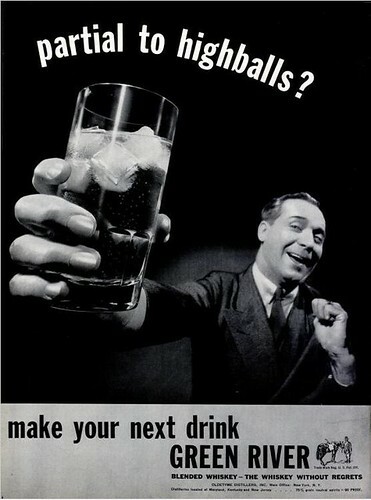 Thank you for posting the vintage ad posters, they put a smile on my face. Yeah, I’m honestly not sure what’s happening there either.